Oxfordshire County Council made the national press for the wrong reasons earlier this year when a story broke that it had banned children from wearing goggles during school swimming lessons because of safety concerns. Not surprisingly the piece included comments from mortified parents questioning the wisdom of the decision and explaining why the use of such equipment works for their young ones. Council leader Keith Mitchell was quick to react to the report, telling the local paper that “I think the blanket ban is a nonsense and have told officers we need to relax this rule”. If nothing else, the publicity brought to the fore a subject that a great many swimmers, whether young or old, have assumed was a given. After all, what could be more innocuous than wearing goggles? Some of the greatest exponents of the sport use them; they can hardly be accused of being performance enhancing; and their relatively inexpensive price means that rather than being exclusive, they are accessible to everyone. The Swimming Teachers’ Association, which is concerned with all aspects of safety in the water and maintaining standards in terms of tuition, is not against the use of goggles but its website does carry some caveats in terms of best practice. These include: accidents as a result of lenses that have been manufactured from glass or certain plastics; correct fitting, and the fact that goggles impair an individual’s ability to handle having water in their eyes. The STA expands on the latter with the explanation that should a child fall into a river or pond, when they are unlikely to have a pair of goggles to hand, they may be less able to handle the situation because they are not used to the sudden exposure to water in their eyes. The STA’s guidelines on goggles go on to state the importance of teaching good fitment and adjustment as well as ensuring any pair purchased meets British Standards. Fitment and adjustment is one of the most common problems – either because the headband is too tight – causing pain around the eye sockets and around the temples and head, or too loose, causing ingress of water and resultant loss of vision leading in all likelihood to an individual stopping suddenly in the water. This could either cause a collision with the person behind or result in a jam should there be a succession of people swimming in the same lane. All it takes to avoid the consequences of this is to pull on the goggles prior to entering the water – don’t attempt to do it once you have entered the pool – and then make the necessary adjustments. Any such adjustments are unlikely unless one or more people are taking turns to use the goggles, which brings up another little rule that is worth following – every individual should have their own pair. The process of fitment and adjustment should also include a quick check to ensure both the rubber seal around the eye lenses and the headband are not showing early signs of perishing. If weaknesses are detected, don’t be tempted to skimp on investing in a new pair. One of the big criticisms of goggles is that, by design, they reduce peripheral vision, which means swimmers will be less visually aware of others in close proximity. Another problem with wearing lenses is that they can steam up, resulting, again, in visual impairment. When the latter occurs, it is important to take a moment to clear the lenses – otherwise not only will you be potentially unaware of the presence of others but you may not see the edge of the pool approaching, which could result in a nasty bump. As the STA makes clear, in an ideal world both children and adults would develop their skills in the water without the need for goggles. There is a very good case to be made for starting children off in the pool without goggles – as with many other things, what they’ve never had they won’t miss and water in the eyes simply won’t be an issue. This may be a little more difficult for adults to cope with but many find that simply putting their head under water and having the courage to open their eyes makes them realise very quickly that it isn’t really an issue at all. 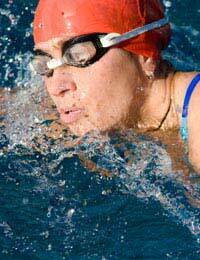 However for many thousands of swimmers, throwing away the goggles will never be an option. For those individuals, it is simply a case of making sure that the equipment they use is fit for purpose. Not only will such simple checks ensure their own safety but also the safety of others using the pool amenities.